Caption slip reads: "Photographer: Lapp. Date: 1951-09-19. Reporter: Ostler. Assignment: Korea veteran baby. 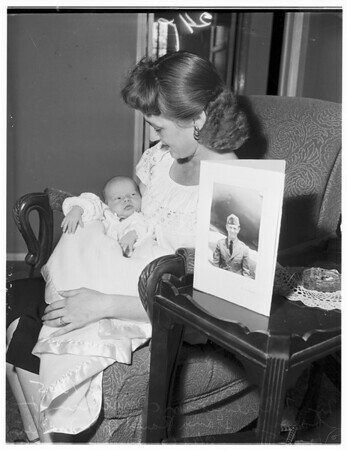 23, 24: Mrs. Florence McMillan & baby boy Dana Rand McMillan, 10 days old and father's picture on table is Lieutenant Howard A. McMillan, Navy jet pilot. For Monday".